"I wanted to talk to you about a novel I'm writing…" Paladin has released the first official trailer for an indie drama titled Submission, from writer/director Richard Levine, adapted from one of Francine Prose's novels. This edgy drama addressing sexual harassment is about a cynical college professor at a small liberal arts college who takes a keen interest in a talented young writing student who admires his work. 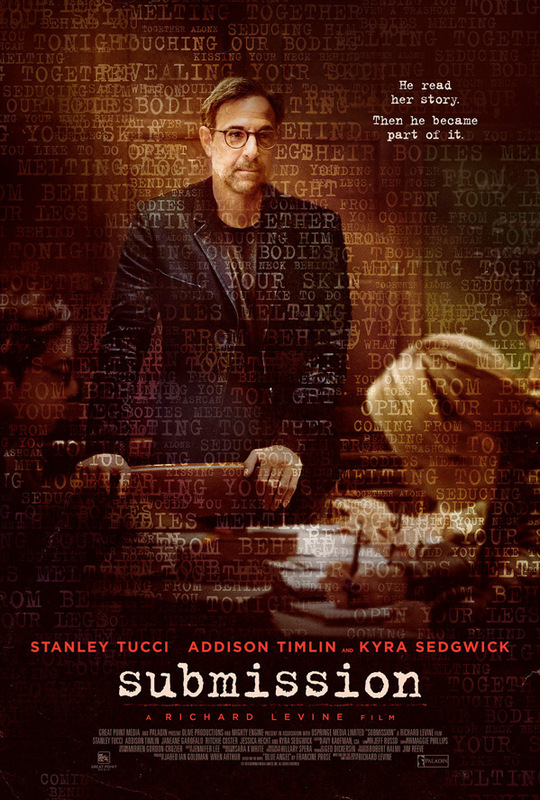 Stanley Tucci stars as the professor, a a once-acclaimed author who meets a student named Angela that makes him question everything. "It's only a matter of time before lines are crossed and it becomes unclear whether Ted is predator or prey and Angela is victim or victimizer." Very interesting description. The full cast includes Addison Timlin, Kyra Sedgwick, Janeane Garofalo, Ritchie Coster, & Colby Minifie. Take a look. Ted (Stanley Tucci) is a once-acclaimed author who teaches writing at a small liberal arts college. Though his marriage to Sherrie (Kyra Sedgwick) is comfortable, he finds himself drowning in discontent -- stuffy departmental dinners at which he drinks too much, smug colleagues whom he dislikes yet fears he resembles, and an endless stream of untalented students. But when a new pupil, Angela (Addison Timlin), shows promise Ted focuses on nurturing her career, and she appears more than willing to devote the one-on-one time required. Basking in Angela's youth, talent, and admiration, just as she benefits from Ted's wisdom, experience, and professional connections, it's only a matter of time before lines are crossed and it becomes unclear whether Ted is predator or prey and Angela is victim or victimizer. Submission is directed by filmmaker Richard Levine, of only the film Every Day previously, as well as producing on TV. The screenplay is also written by Levin, adapted from Francine Prose's novel. This first premiered at the Woodstock Film Festival last year. Paladin Films releases Submission starting on March 2nd coming up.